The crow is a bird found in all countries. They are large, harsh-voiced birds normally of black colour or of some mixed colours. Their beaks are heavy and feet stout. A crow’s voice heard in the southern direction is of a strong value. 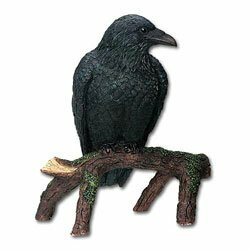 For the people of the eastern countries the sight of crows to their right or a female crow to their left is favourable. This is to be reversed in other countries. 1. If a crow is sighted in the early part of the day, flying from the north-east direction, then you will receive some important and auspicious message. 2. If a number of crow assemble at one corner of a city or village and caw loudly it denotes some calamity to the city. The head of that place may face some difficulty. 3. If such crow inside the house top it is inauspicious. And in case they crow inside the house, it is a warning of serious trouble to the owner of the house. 4. If a crows sits on anybody’s head he becomes lazy. It is a sign of bad luck. 5. If a crow sits on the head of a girl or a lady, it denotes the death of her lover, paramour or husband. 6. If in the last part of the day you see a crow coming from south-west, it indicates early disaster. 7. If in the last part of the day you see a crow coming from the south-east direction, you will surely gain money. 8. If a crow appears during night it denotes the death of a person. 9. If a crow brings meat, bone, ash etc. and puts it on the cot it indicates death or a calamity for the person who sleeps on this cot. 10. If a crow sits in a circle, loss through enemy is indicated. 11. If a crow crows from the left side of a person setting out on a journey or for work and flies beside him it is always auspicious. 12. But if it appears from the opposite direction it indicates some hindrances in work etc.